Bail Bonds Va posts Bonds in these locations. 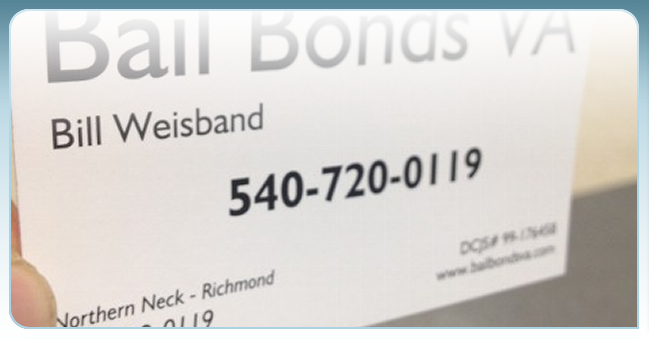 Bill Weisband and his bail bond agents provide bonding services in over 15 jails in Virginia including Stafford Virginia at the Rappahannock Regional Jail. This jail serves four counties, Stafford, Spotsylvania, King George and Fredericksburg. Our bondsmen also serve Prince William Adult Detention Center. Culpeper County Jail, Fauquier County Jail and the Central Virginia Regional Jail in Orange Va. With over 1000 clients per year, we are fast, professional and sympathetic to the needs of our clients. Our mission is to bond our clients out of jail as quickly as possible...any time of day or night. We also work with the Nations Leading Private Pretrial Reporting Company. Remember! The U.S. Constitution's 8th ammendment states that Bail should not be excessive... you are presumed innocent until you are proven guilty. Let me help you through the process.